Services a Drone Company Can Perform for You | Canadian UAV Solutions Inc. Services a Drone Company Can Perform for You | Canadian UAV Solutions Inc.
Aerial Inspections- There are some views that are just better from the top! A drone company can provide you with opportunities for aerial inspections of your property, wind turbines, solar panels, or roofing. Agricultural and Environmental Assessment- These inspections allow you to get a true and concise lay of your land and easily identify where the source of potential leeching or damage has occurred. You can even watch how your land changes from year to year and make decision as to where fertilizer, water and other nutrients need to be distributed. Construction & Engineering- In order to properly construct on a parcel of land, you need to do many different types of surveys. Drone surveys are quick and highly accurate. 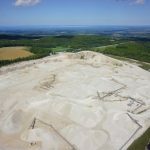 Aggregate & Mining- In addition to looking above the land, drone companies have interests in what you do below it as well. 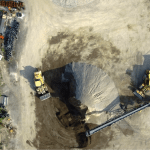 With aggregate and mining surveys, we can monitor your stock piles in terms of volume and quantity, digital elevation models, and other services. Survey & Mapping- Save lots of time with a topographic survey and mapping services from a drone company. If you would like to learn more about what a drone company can do for your needs, see us at Canadian UAV Solutions Inc.